U.S. 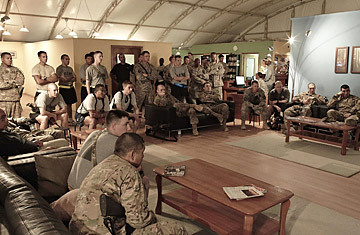 Soldiers watch TV at the USO Building in Kandahar Airfield as President Obama announces the death of Osama Bin laden. Osama bin Laden's death is making waves around the world. But among U.S. troops deployed in Afghanistan, the country from which the al-Qaeda chief and 9/11 mastermind once declared war on the United States, there was barely a ripple. At a large recreational facility on Kandahar Air Field, about three dozen troops gathered around a pair of big-screen televisions Monday morning to tune into President Barack Obama's announcement. There were no impromptu cheers or chatter to be heard, just crossed arms and blank expressions. Nearly as many troops continued shooting pool and playing video games in background, nonplussed by the news. "It's not like we're gonna get up and leave right away," says Sgt. Scott Willoughby. "[Bin Laden] is dead, but we're still here." His take was echoed by Spc. Ricardo Siqueiros, a fellow soldier who was more absorbed in a heated game of Tiger Woods PGA Tour 10. "Whatever ... I'm not really concerned," he says, noting that he has two more deployments to serve before he can leave the military. While some Afghan government officials hailed the news as a significant blow to Taliban morale, they too downplayed its impact on the conflict. (Al-Qaeda is estimated to have only 100 or so fighters inside Afghanistan, with less strategic influence on the insurgency.) The reaction was similarly muted at street level, with Bin Laden's end seen as little more than a footnote to the costly war he set in motion as a guest of the Taliban long ago. "The war goes on and on and Afghans are dying. That's all that matters," says Abdullah, a Kandahar taxi driver. Nearly a decade after Bin Laden's henchmen brought down the Twin Towers, his legacy looms larger than his life. Since ousting the Taliban regime that gave him safe haven, the U.S. has poured ever-increasing amounts of money and manpower into Afghanistan to improve governance and tame a resilient insurgency. Although President Obama has promised to bring home some of the 100,000 troops serving in the country this summer, several more years remain before a deadline to hand over security responsibilities to Afghan forces  and the Taliban is far from a spent force. Mullah Omar, the Taliban's one-eyed leader, remains at-large and is still believed to be hiding across the border in Pakistan where Bin Laden was killed. A day after the Pentagon released a report that the insurgents' momentum had been "broadly arrested," the Taliban on Saturday announced the start of their spring offensive. Despite heavy losses on the battlefield, the insurgents have recently carried out a series of high-profile attacks on U.S. and Afghan military installations, and are expected to ramp up the frequency of propaganda stunts to project a greater threat than they can muster as the fighting season intensifies. On Sunday, the first day of the self-declared offensive, a 12-year-old suicide bomber killed four people and wounded 12 others in the eastern province of Paktika. Meanwhile, U.S. forces in Kandahar province are on alert following a spectacular prison break last week that saw more than 480 inmates escape, most of them thought to be militants. U.S. officials worry that a flush of hardened fighters could give the insurgency a sorely needed boost on the southern battlefront. With more pressing concerns at hand, U.S. troops roundly gave the impression that Bin Laden's killing doesn't give the kind of boost it might have had it occurred at the start of America's longest war, when vengeance burned hotter. Indeed, many soldiers in Afghanistan were not even teenagers when the U.S. came under attack in 2001. "Back then I think there would have been a big reaction, but [his death] won't have any effects on our day-to-day operations here," says Capt. Jason Johnson. "It's business as usual." See pictures of a Bin Laden family album.